The Discovery Chemistry group has multiple openings for a Senior Scientist I, Chemistry. Clark, NJ: L'Oréal is looking for a senior chemist. Experience in skincare, makeup or haircare preferred. B.S. in chemistry (8-10 years formulations) or M.S./Ph.D. w/ 2-5 years. Brevard, NC: I see PharmAgra is looking again. It's like swallows to Capistrano or something. Germantown, MD: Intrexon desires an M.S./Ph.D. protein LC/MS chemist. Looks to be entry- or early-mid level. Bartlesville, OK: I see that Chevron Phillips Chemical is hiring a synthetic chemist; looks interesting, especially the comments about organosulfur chemistry. MM Lab, Inc. is in the process of designing and building a 2,500 sq. ft. state of the art laboratory to perform all State of Nevada mandated Medical Marijuana testing for usable marijuana, marijuana-infused products, extracts of marijuana and edible marijuana products. The Company’s objective is to deliver a premier model of laboratory services by providing analytical support and professional consulting to marijuana cultivation facilities and the marijuana product industry to insure the safety and efficacy of medicinal marijuana products. Salary: 90,000.00 - 130,000.00, with "Generous bonus program available." Huh. Applicants or nominees should have a terminal degree in a Pharmaceutical Science or related field and qualify for appointment at the rank of associate professor or professor, with a distinguished career in education, academic research and scholarship. The ideal candidate should have at least three years of administrative experience and at least five years of research and teaching experience at the graduate level. Candidates should have experience in securing extramural funding. Candidates should have demonstrated evidence of creative, innovative and effective teaching, research, leadership, and management. Candidates should have excellent skills in communication, personnel management and evaluation. The ideal candidate should be familiar and have worked with an Office of Research, Graduate School and other related university bodies. Candidates should be knowledgeable of challenges facing educators and research in the pharmaceutical sciences or related fields. Candidates must value ethics and cultural diversity. Stanford, CA: Stanford University is looking for an assistant professor in chemistry. Tampa, FL: The University of Tampa is searching for an assistant professor of organic chemistry. We are interested in candidates with research goals in all aspects of materials design, characterization and applications in fields such as energy, biomedicine and photonics with special emphasis on the development and utilization of electronic structure computational methods. Data are no small part of the equation, he adds, noting that data-based quality management principles, such as quality by design, are gaining momentum in process development. Design of experiment, a statistical method of multivariable analysis in R&D and process engineering, will be a critical practice as data and statistical analysis become the common ground of chemistry and engineering, Villax says. I sure wish I knew what Mr. Villax meant by "computer simulation" -- also, that people in their 50s don't know about computers is, in my opinion, rather an odd thing to think. Rudolf Hanko, CEO of Siegfried, a Swiss CMO, wants even further development of the chemistry needed for API production. The challenge posed by complex drugs, he says, “is that organic chemistry, despite progress over the past 150 years, is still not a science that allows you to synthesize molecules in a convergent way.” Rather than extol the virtues of being able to manage a complex, multistep synthesis, Hanko says, CMOs should seek to design routes that reduce the number of steps or allow them to be taken simultaneously. The result, Hanko explains, is molecules that cost $60,000 to $100,000 per kg. 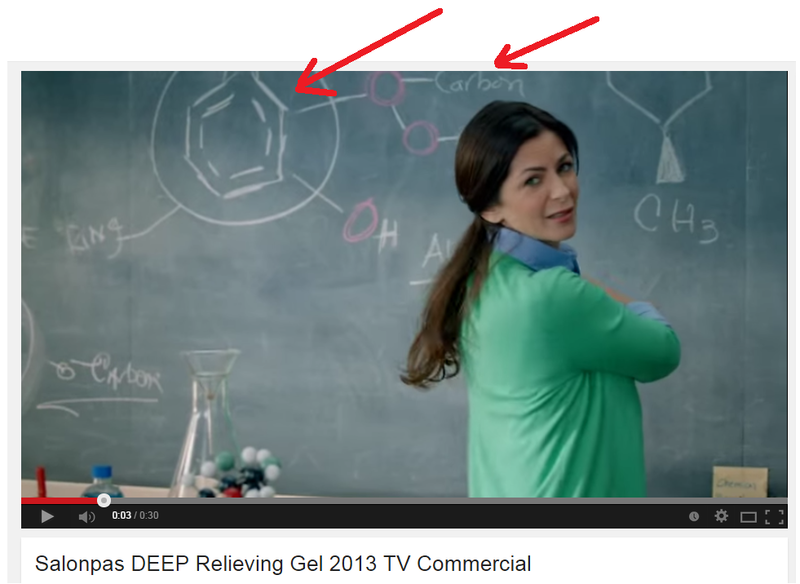 I am kind of confused by which molecules Hanko is talking about (e.g. 15 to 20 linear steps), but nevertheless, the point about truly convergent syntheses is well-taken. Anyone want to explain the chemistry of diapers? ...Newscripts recently waxed enthusiastic about Charlie’s Soap, “a laundry detergent brand that is popular among folks concerned about laundry residues” (C&EN, July 7, page 40). Charlie’s Soap is good, we are told, because it contains fewer ingredients than other detergents. It seems to contain only soap and soda ash. Charlie’s Soap might actually work—if you are washing in distilled water. That would include approximately none of us. Any hardness in the water at all will precipitate the soda ash as calcium and magnesium carbonate. Even worse, the soap will precipitate as scum. Those diapers you were trying to wash to a residue-free condition will be loaded with sharp-edged crystals of calcium carbonate, which will abrade the fibers of the diaper, shortening its life. Additionally, that residue will be alkaline in nature, and hence irritating to the poor child of the ignorant parent. The diapers will also be loaded with soap scum that, in the short term, will make them appear gray and dingy. In the long run, the accumulated scum will make the diaper harsh to the feel and no longer absorbent. Formulating any kind of product to the fewest number of ingredients is a truly bizarre, and wholly irrational, goal. Ask anyone who has ever said it for the reason why. I have yet to hear an answer to that question. Mother Nature doesn’t hold herself to such an unrealistic goal. In a recent issue of Inform (published by the American Oil Chemists’ Society), the ingredient list of a common chicken egg was published. The list, almost certainly not exhaustive, contained about 100 different ingredients. Unfortunately, the statement about the fewest ingredients goal is never challenged. It’s the kind of thing you would expect to see from Consumer Reports or Greenpeace. But it’s not the way to get things clean. It’s disappointing that C&EN reported it unchallenged. I could go on and on about this one little story. Dryer sheets add so little hydrophobic wax to fabrics that they have virtually no effect on absorbency. (Rinse-cycle fabric softeners are a different story.) The ammonia stink from diapers is not due to microbes not removed during washing. The diapers do not come out of the dryer sterile, of course, but they are sanitary. The microbial load comes from what the baby deposits in the diaper. The next time you need to know how to get something clean, contact Walt or me. Don’t depend on someone who is trying to make a buck by pandering to the public’s fear of chemicals. I don't really know if calcium carbonate deposits happen in diapers that have been washed with Charlie's Soap -- anyone up for doing some wet chemistry with diaper residues? I didn't think so. Diaper rash: Diaper rash shows up mysteriously with your kid, so you start by changing one parameter (the laundry soap). It either goes away or it doesn't, and then you start changing multiple parameters, including having the kid run around naked. Finally, you settle on something that seems to work for you. Diaper wear: Cloth diapers are a rather high capital cost, so you're tempted to keep re-using them. As the diapers get older, they seem to absorb less and less (as the kid seems to produce more and more waste). So, you start changing the washing routines (detergents, hot/cold washes) to start removing whatever seems to be building up in the fabric... or you buy new ones. There's probably a lot of science out there about this that I don't know about -- readers? One final note: I thought it was interesting for Dr. McCall to address the root cause of these concerns to be chemophobia on the part of parents. I tend to agree with him; however, I suspect he misses the emotional appeal of having fewer chemicals touching the nether regions of one's children. Sure, simplicity in diapers is probably a fallacy, but the temptation is understandable. Mitch Jacoby has an interesting article about chemical companies participating in science industrially-oriented master's programs. I think that the key will be: will the participating companies be willing to eat their own dog food? 20 chemists worth following on Twitter, by Lauren Wolf. * Happy to be involved in this effort. I like the fact that the letters-to-the-editor section has room for people to tell "the rest of the story"; this one about a Chinese coal-to-chemicals firm is a good example. For my Geek Girl Con Act of Whimsy, I need the number of inaccurate or misleading statements in the following Food Babe videos. If you can help, please listen to just 1 of the 5 following videos and count how many false or misleading things she says. Err on the generous side, if possible. Meade’s time as the business chief at DTRA also coincided with a culture clash within the agency, one confirmed by three other people familiar with the agency who declined to speak on the record. DTRA had hired several people with experience at private pharmaceutical companies who were used to killing programs that were going nowhere and spending money on promising ones. The people with pharma experience, she says, in turn failed to show the patience necessary to work in any government agency. “Frequently, what [government contracting officers] were requesting was ridiculous,” she says, “but you know what, you just do it.” One trick to federal contracting, she explains, is to know when not to fight. I dunno, I'm relatively skeptical. Employment Information Service (KEIS) announced the results of analyzing the number of jobs per job seeker – the index to gauge the supply and demand of manpower – by calculating it with statistics, as of July of 2014, about finding jobs and people from WORKNET, a state-run Internet site for job hunting. If the number is smaller than 1, it indicates that getting a job is challenging due to a shortage of job. In contrast, if the number is greater than 1, it means that securing a job is not so challenging since jobs outnumber job seekers. According to the results, the fields of textile, clothing, electricity, electronics, security, construction, public health, etc. show the index point 0.4~06, which implies that the number of jobs falls short of that of job seekers. Unlike those areas, the index point in jobs relating to chemistry (2.33), materials (1.94) – metal, glass, and cement – machinery (1.15), and processed food (0.96) is either over 1 or close to 1, which tells job seekers are highly likely to find a job, although it may be possible for a company to find it not easy to hire a person that it is in favor of. Anyone know if this is believable or not? 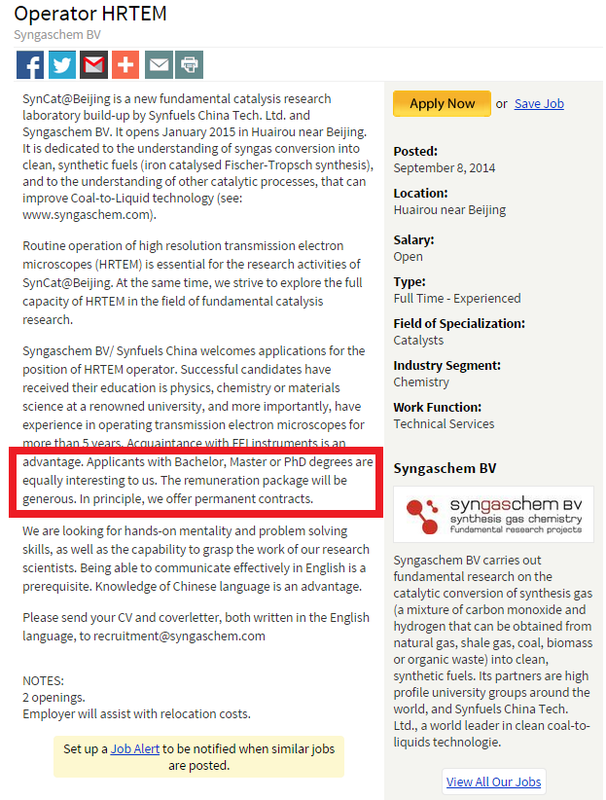 I don't know much about the South Korean #chemjobs market. The online application should include a cover letter, a curriculum vitae, a one-page statement of teaching philosophy, a five-page summary of research interests, and the names and email addresses of three references. Review will begin November 3, 2014 and continue until the positions are filled. Questions should be addressed to Prof. Martin Margittai, Faculty Search Committee Chair at biochemsearch@du.edu. The University of Denver is committed to enhancing the diversity of its faculty and staff and encourages applications from women, minorities, members of the LBGT community, people with disabilities and veterans. The University is an equal opportunity/affirmative action employer. Best wishes to those applying! Personal Statement: The Division of Organic Chemistry (DOC) of the American Chemical Society has a rich, venerable tradition in serving its membership. Some examples include organizing and sponsoring venues to communicate our research advances, awarding members to honor distinguished research and service to our community, and providing materials and services to support our discipline. Coupled with these important traditions is our rapidly-changing economic, social, and technological environment which requires the DOC to adapt and capitalize on these changes. If elected as chair of the DOC my key objective will be to explore how the DOC can best serve our Division’s evolving demographics in our rapidly changing economic and social environment while maintaining the bedrock traditions and services of the DOC. As examples, how do we best serve our young organic chemists who use different technologies to socialize and communicate and face a more difficult economic environment for job prospects? Furthermore, how do we best serve our retiring members who will become a larger segment of our Division? With advances on this agenda I believe the DOC will be better positioned in the future to serve and add value to its diverse, changing membership. Personal statement: My nearly 20 years' experience in the pharmaceutical industry has given me a valuable perspective to address the challenges faced by individual organic chemists and the ACS Division of Organic Chemistry, as a whole. Working with the DOC, I am very interested in selecting scientific themes for DOC-sponsored symposia that are highly relevant to current research topics in Organic Chemistry, both for academic and industrial scientists. In addition, I am passionate about career development for organic chemists, not only for scientists who are emerging from academic and post-doctoral programs but also for mid- and late-career organic chemists. Since my research interests span multiple chemistry disciplines, I would also like to foster interactions between the different disciplines in Organic Chemistry, improving interfaces with other ACS divisions and sponsoring partnered initiatives and scientific symposia. Finally, I believe that science, above all, is fun, and I would like to promote a fun and productive environment in the DOC. I look forward to seeing how either one of these candidates decided to move the DOC towards better serving its members' employment needs. *Biographies were truncated to the first sentence only. ...Based on our review, FDA has determined that many of your Young Living Essential Oil products, such as, but not limited to, “Thieves,” “Cinnamon Bark,” “Oregano,” “ImmuPower,” “Rosemary,” “Myrtle,” “Sandalwood,” “Eucalyptus Blue,” “Peppermint,” “Ylang Ylang,” “Frankincense,” and “Orange,” are promoted for conditions that cause them to be drugs under section 201(g)(1)(B) of the Federal Food, Drug, and Cosmetic Act (the Act) [21 U.S.C. § 321(g)(1)(B)], because they are intended for use in the diagnosis, cure, mitigation, treatment, or prevention of disease. The intended use of a product may be determined by, among other things, its labeling, advertising, and the circumstances surrounding its distribution, 21 C.F.R. § 201.128. As described below, the marketing and distribution of your Young Living Essential Oil products without FDA-approved applications is in violation of the Act. I suspect that FDA basically plays a giant game of Whack-A-Mole regarding quack websites like this, but hey, could be worse. Imagine my dismay to open up the front page of the ACS to see that headline. An example of Betteridge's law in action, for sure. The edX course (Medicinal Chemistry) starts October 13th and runs eight weeks. Target audience: anyone with an interest in the structural basis of how drugs are designed. Sounds like an interesting class! Rudy Baum hit a sore spot with his editorial “Menacing Cell Phone Towers” on whether cell phone towers and the microwaves they emit are hazardous (C&EN, July 14, page 3). He presents his opinion as editor-in-chief, but the editorial then has an ACS disclaimer. That’s been one of my disappointments with ACS over 60 years: It’s gutless. If ACS isn’t an “authority” on chemical risks for the public, then who is? Along the same line, New Jersey is now passing legislation to ban smoking in public parks, beaches, and so on. As a Ph.D. chemist who spent a good part of my career working on detection and control of hazardous materials, I’ve tried to point out that the hazard from such incidental exposure is nil. And I’ve tried to point out that there usually is no correlation between odor threshold and hazard threshold, but, again, no one wants to listen. Years ago, a science teacher cursed me out on the phone because of such a position of logic and science. There are many similar issues. An individual taking an opposing viewpoint is vilified, while lousy science is embraced. Years from now, when no improvements result from such restrictions, others may finally see the light. In my opinion, ACS has a moral responsibility to stand up and speak out for truth and science, rather than sitting on the sideline because of fear of its commercial advertisers. I suspect that this has been a major fight over the years within ACS -- should ACS stand up for specific classes of chemicals? How can it speak the scientific truth without bending to its members (some of whom work for major chemical manufacturers?) Surely, with cell phone towers, the large preponderance of the data is that electromagnetic radiation from them is mostly harmless. I wish I knew the history of ACS and whether or not it's taken stands on specific chemical issues over the years: PCBs, Agent Orange, etc. My guess is 'no', but I dunno. Readers? C&EN's Andrea Widener covers the NSF physical scientist unemployment numbers, which show that doctoral physical scientist have a 2.1% unemployment rate in 2013; perhaps we should not be comparing a group of 100% Ph.D.s to a labor force that has some members without bachelors or even high school degrees? Interesting review of a book about the early days of birth control pills by Audra Wolfe. The discovery that you’re overqualified for many advertised jobs often comes as a rude shock. You’ve seen the ads, as Jonathan did, seeking skills in your area of expertise—but the employer hasn’t specified a Ph.D. Instead, the employer is seeking someone with a Bachelor of Science or a Master of Science degree. That’s not ideal, but you have those degrees, too, so why not apply? “Each of our labs has openings for B.S. or M.S.-level scientists who play a key role in our research effort. But those labs also have positions for Ph.D.s, and the two are completely separate roles,” says a client of mine, a human resources (HR) manager for a multinational R&D institution. I told the client a story that Jonathan shared with me: Jonathan called a networking contact and found himself speaking to the hiring manager for a position he had applied to previously. He asked why his application hadn’t succeeded, and the hiring manager gave him an answer: He was overqualified for the position. My client gasped audibly when I relayed that story. This was, apparently, a violation of standard protocol: Managers should “know better than to provide a lot of color,” my client says. Apparently, they’re not supposed to reveal that much about why they didn’t hire you. That’s why you rarely get a direct answer to questions like that. My HR contact, though, shared more information with me about being overqualified, so now I can share it with you. Read the whole thing, if only so you can share in my irritation. I can't help but agree with Mr. Jensen that applying for and accepting a B.S./M.S.-level position is rather unwise, in that it is a dramatically different role than Ph.D.s. What I am surprised at his choice to not talk about why they might be applying for these roles, i.e. they can't find work as Ph.D.-level research scientists. Finally, it's sad that, in our lawyer/lawsuit-phobic* culture, we apparently can't tell applicants what we think about them. It's good for companies, sure, but it sure leaves the applicant confused. We need to be giving people feedback, even it's unpleasant. I am not really one to suggest changes to federal law, but it seems to me that passing a law to offer employers limited immunity to lawsuits in exchange for telling applicants (especially on-site interviewees) their weaknesses would be a good idea. Wow... I'm sure glad I didn't follow this guy's advice 8 years ago when I applied to my current company. I am a PhD chemist, and had been working as a postdoc in a national lab. I applied for a BS/MS posting because it was exactly in line with what I wanted to do and looked like a nearly perfect match for my skill sets. The only drawback was that they were looking for someone at a lower degree level. When I interviewed, I learned that the position was a replacement for a technician who had left the company. The group was looking to increase its skill level, and thought a BS/MS was the right slot for the job. I convinced them I'd be a better choice, and though there were some growing pains initially (group didn't function properly at first when I changed the role from technician to scientist), I was eventually promoted to lead the group. I've been doing that for the past four years. I also make significantly above the ACS salary median for PhDs, so it's not like I locked myself into a low-paying role by applying for an MS position. I've been on several recent hiring committees, and in many cases we consider candidates with different degree levels. I actually interviewed someone today. In his company, the only people who advance up the science ladder are PhDs, and he's looking to get out of there specifically because of that culture (has a BS + 15 years of technical & managerial experience). He stated that one of the reasons he applied for this position is because he's heard that it's still possible to advance in our company without a doctorate. This is definitely true, and is supported by the fact that two of our current top scientists have MS degrees. I therefore take a stance that's opposite from Jensen's: If you have a PhD and there's an MS level position that looks attractive, you should absolutely apply for it. If the company has the right culture, you might just get the job and find yourself in a place you can spend the rest of your career. I think the trick is, most large enough companies have HR/hiring cultures that are more like Jensen's client and less like Anon's. More's the pity. Via H1-b skeptic Norm Matloff's blog*, I see that NSF has reported the rate of all chemistry Ph.D.s that are involuntarily working outside of their field at 2.0% for 2013. This is defined as "Involuntarily-out-of-field rate is the percentage of employed individuals who reported, for their principal job, working in an area not related to the first doctoral degree at least partially because a job in their doctoral degree field was not available." As far as I'm concerned, this is incredibly low, to the point where I'm rather skeptical. I'd be much more inclined to believe a higher number, but perhaps I'm wrong. *I label this not pejoratively, just for those who do not recognize Prof. Matloff. M.S.F. also needed to get blood samples to a lab capable of testing for Ebola and other exotic pathogens. To that end, a charter plane was dispatched from Conakry to an airstrip outside Guéckédou. Blood samples with suspected Ebola virus are categorized for transport by a special code, UN 2814, indicating “infectious substances, affecting humans,” and M.S.F. hired a specialty logistics operator to send the samples, which were packed according to a strict protocol, with three layers of protective and absorbent material. Then—because it was simply the fastest way—the samples from Guéckédou were loaded onto the daily Air France red-eye from Conakry to Paris. On April 4, passengers on the Air France flight from Conakry were quarantined when the plane landed at Charles de Gaulle Airport, in Paris, and not allowed to leave until each was checked for fever, all because someone had gotten sick in the lavatory. Emirates airline had stopped flying to Guinea. Mining companies had pulled out their foreign staff. In the capital, radio stations were broadcasting ads for the best brands of chlorine, to protect yourself from Ebola, and Batchyli saw an article about “rebels dressed in yellow who attacked Guinea and then disappeared”—the interpretation of a local journalist trying to make sense of all the people in big yellow protective suits who had suddenly descended on the country. I'm going to guess that chlorine is chlorine and that Ebola is pretty non-resistant to all brands, but tell that to someone who's living in the middle of that. Yikes. Thanks to @fxcoudert, who notes that there is more than one way to spell Hartree-Fock. Warning Letter of the Week: bare hands! In addition, the investigators observed serious deficiencies in your practices for producing sterile drug products, which put patients at risk. For example, our inspection found your facility was not physically designed and environmentally controlled to minimize airborne contamination, and the ISO 5 hood was located in an unclassified area. This area had no HEPA filters, no air pressure differentials, and the “sterile product compounding room” and the “ante room” were separated by plastic strips that provided no actual “room” separation. Your firm did not adequately monitor and control the microbial and particulate quality of the environment and personnel. Additionally, the flow and handling of materials that were placed in the ISO 5 hood posed an unacceptable contamination hazard. Operators loaded the materials on a tray in the ante-room with bare unsanitized hands and then they carried the tray to an unclassified room. The outer surfaces of these materials were not disinfected prior to entry into the ISO 5 hood. Furthermore, there was no hand washing prior to donning gloves or gowning, and the operators touched non-sterile surfaces and proceeded with aseptic manipulations without sanitizing their gloves. A Form FDA 483 was issued to your firm on March 21, 2014. You have to wash your hands before donning gloves? Who knew? There actually are jobs – in industry, consulting, government and other fields. Biomedical postdocs rarely end up unemployed. But many can't pursue their academic dreams, and they are often in their late 30s or even older before they realize that. 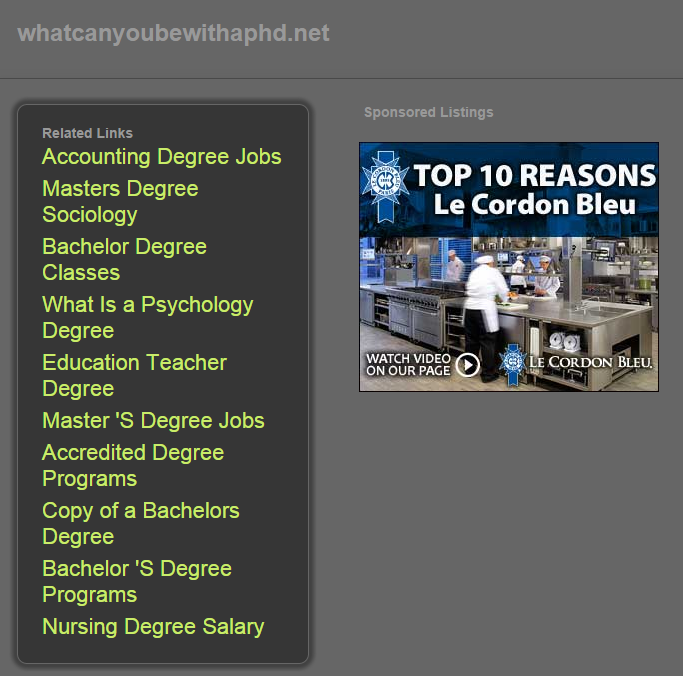 The fact that the link that the "other fields" sends you to is dead is a rather delicious irony. For biomedical researchers, the number of industrial and governmental research positions is relatively limited and there aren't enough open slots to absorb all the postdocs there are. While biomedical postdocs rarely end up unemployed, there is no measurement for underemployment, which is a real problem. Harris alludes to, but does not cover, 1) the massive time to degree issue of biomedical Ph.D.s (7+ years) and then the time period of a couple of postdocs. Let's face it, you can't take over a decade to train for a career, not get that career and not suffer a massive amount of opportunity cost. As I have said before (and still believe), the massive quantity of postdoctoral fellows and all the people who leave biomedical research is the negative externality of the current way that we get biomedical science done in this country. Sure wish we could come up with a different system. I found this letter by Martin Feldman of Howard University very interesting and a rather pointed critique of this letter by Professor Rigoberto Hernandez. Quite a number of interesting findings in this ACS survey on graduate student satisfaction (article by Linda Wang.) Amusing that 20% of people find their stipends financially difficult -- what do the other 80% think? It seems pretty clear to me that the ACS really, really wants to get involved with the Chinese Chemical Society -- I wonder what the internal discussion has been about. Courtesy of Bubba at In The Pipeline, a truly amusing set of bad chemistry structures behind this fake chemistry teacher. "If you don't watch TV between 6 and 7pm, then you are entirely missing the public face of pharma." Oh, dear, I'm afraid that's true. Politicians love to tout the importance of science, technology, engineering and math majors. But when it comes to earnings, the “S” majors don’t really belong with the “TEM” ones. Engineering majors are nearly all high-paying. So are most computer and math majors, and math-heavy sciences like astrophysics.3 But many sciences, particularly the life sciences, pay below the overall median for recent college graduates. Students who major in neuroscience, meteorology, biology and ecology all stand to make $35,000 or less — and that’s if they can get a full-time job, which many can’t. Zoology ranks as one of the lowest-paying majors of any category, with a median full-time wage of $26,000 a year. 3. There are a few exceptions to this. A few technology-related majors, such as “communications technologies” and “computer networking and telecommunications” are relatively low-paying. But these are mostly lower-level, technically oriented majors. Interesting data, more later. Read the whole thing. ...A Nature article published in 2011 contends that the academic positions for science PhD holders are decreasing and sectors outside of academia are unable to compensate. Yet the unemployment rate for PhD graduates in the life sciences remains at a low of 1.5%, much lower than the national unemployment rate in the United States. So are there too many PhDs? First, it's clear that the purpose of the essay isn't to engage with the "Are there too many PhDs" question. That's fine, but then, why bring up the statistics as if they're refutation of the Ph.D. glut theory. The writer claims above that this is the unemployment rate for Ph.D. graduates in life sciences -- so far as I could tell, this is not actually true. The number "1.5%" and "life sciences" are not tied together anywhere in the report. Maybe I'm wrong. My main issue is this portion of the sentence "much lower than the national unemployment rate in the United States." It is ridiculous to compare the unemployment rate of recent Ph.D. graduates in the sciences (any sciences) to the national unemployment rate. ~30% of the US population has a B.S. degree; college graduates make up around 47% of the workforce. We should not be comparing a group of 100% Ph.D.s to a national workforce where less than 5% of the workers have a Ph.D. It is a meaningless comparison. 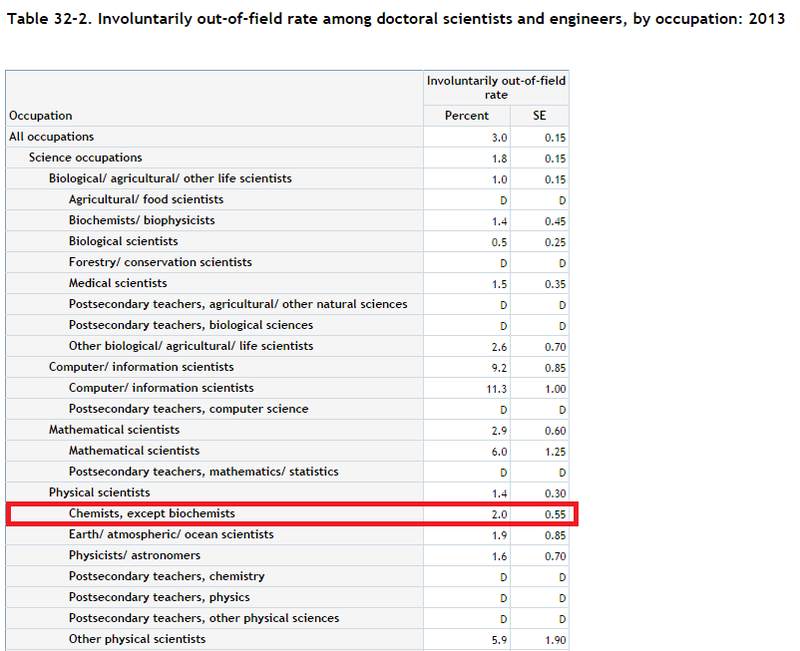 The better number to compare against is the overall unemployment rate for Ph.D.s, which was 2.2% for 2013. Of course, the problem with this is, we're now measuring all Ph.D. holders, including your tenured faculty adviser. Also, the writer does not consider wages or opportunity costs of getting a Ph.D. in the sciences (time-to-degree for life scientists? In 2012, 6.9 years, according to the 2014 NSF Survey of Earned Doctorates.) If you're spending two presidential terms in school, you should seriously think about whether it's worth your time, from a dollars and cents perspective. Sometimes it is, sometimes it isn't. But those calculations weren't apparently covered in this essay. Finally, I have a one-word answer for the writer as for why the unemployment rate of life scientists is so low: postdocs. Actually, I have another word: underemployment. If you have a Ph.D. biologist working as a QC temp at VWR, they're considered employed. For longtime readers of the blog, this is old hat. 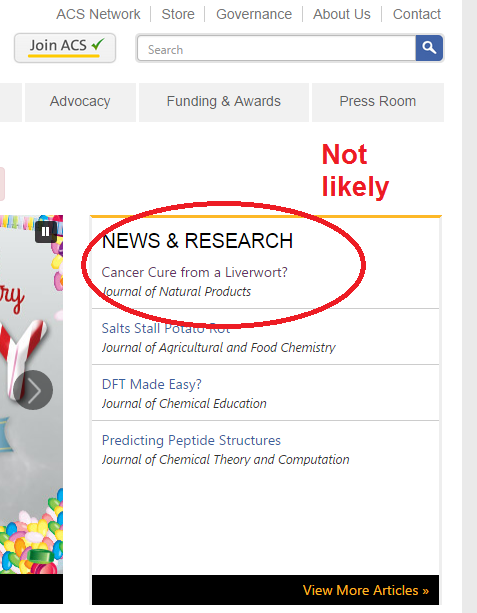 But for the editors at Naturejobs, apparently, this is news -- how disappointing. Alkermes R&D is searching for an experienced medicinal chemist to play a key role in advancing the drug discovery pipeline. The incumbent will propose synthetic targets, design synthetic routes, interface with outsourced medicinal chemistry resources, and develop structure-activity relationships (SAR) to drive the iterative optimization of leads. Additional responsibilities include participation in experimental planning, data analysis, and presentations at team meetings and company meetings. The individual will support multiple programs through participation on internal cross functional working teams including in vitro and in vivo pharmacology, ADME, toxicology, pharmaceutical development, analytical development, and legal departments. A strong background in synthetic organic chemistry and medicinal chemistry, combined with high creativity and strong leadership and communications skills are essential. Minimum Education & Experience Requirements: Ph.D. with emphasis in organic and/or medicinal chemistry or related discipline and at least 5 years of post graduate drug discovery experience. Link here. Best wishes to those applying. Courtesy of my morning ACC Smartbrief, I see that Accenture has put out a report about the shale gas revolution and how the chemicals industry needs to prepare for future economic conditions once the boom is over. 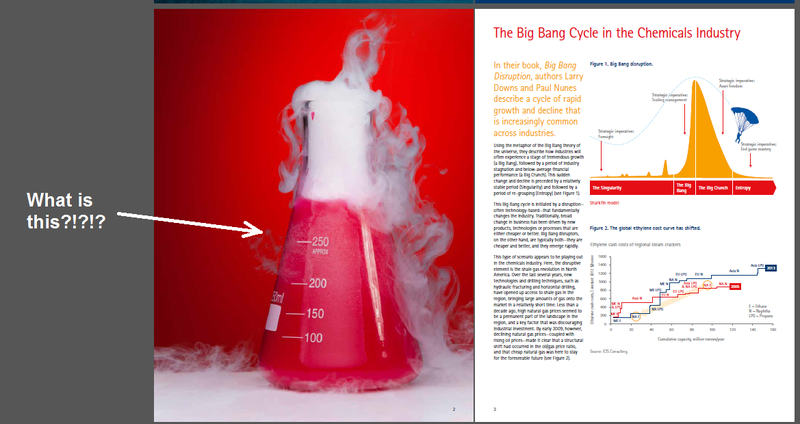 All fine, but the report (PDF here) is marred by horrifyingly amateurish graphics of colored water in flasks, soap bubbles and dry ice in water. If they had put "IGNORE ME, I KNOW NOTHING OF YOUR WORK" in 72-point font across the bottom, the effect could not have been worse. In practice, though, we might not. I'd love to know what translation error led to this little booboo. I presume it's "as a principle". ...Mills made a promise to her husband years ago that she would retire at age 65 so that they could spend more time traveling and hiking together. They plan to move to Oregon after the current school year. “I’m grateful to my husband for forcing us into this idea because the one thing I want to do is leave before the department wants me to leave,” she says. Being retired doesn’t mean disengaging from chemistry, however. In fact, in her emeritus status, Mills will be joining a research group at the University of Oregon that is doing computational chemistry in an area related to her current research. But she will be doing research at her own pace, and she will have the freedom to take extended trips with her husband. Professor Padwa's comments about very dedicated professionals is a bit frightening to me, considering that some version of that (although I'll never reach his stature!) is a goal of mine. The health of my marriage is more important to me than my career, but I am sure that a younger Al Padwa would have agreed with my statement, too. Lisa Jarvis covers the financial aspects of the ALS ice bucket challenge. We need to revisit this 10 years from now and see what difference it made. Quite a set of articles on academic jobs by Susan Ainsworth and Linda Wang. I learned a lot from this Beth Halford feature on HIV and gp120. This Rick Mullin article about the growing biotech industry in New York City (registration required) reminds me that a metric to rank biotech hubs would be a useful tool, sort of. Love it when even C&EN readers are duking it out over GMOs. I'm a little skeptical of the new American Association of Chemistry Teachers, but we'll see how it goes. Who gave Bill Gates his C+ in organic chemistry? The long policy article of the weekend was probably the New York Times Magazine article on Bill Gates' desire for an integrated history course. I think it is pretty awesome that he admits to a C+ plus in organic chemistry. So who taught Gates organic chemistry? It would probably have been between 1973 and 1975 or so... Was it the Fiesers? (Substantively, I don't think the article addresses what I want to know, which is "What has been the history of teaching world history? How does Gates' course fit into that, and are there prominent examples of this sort of curriculum either succeeding or dramatically failing?" On page 53, an interesting chemistry-related discussion of Halliburton defoamer and the decision to pump "foamed cement" into the well. One of the control devices was improperly wired and no tests were performed that would have detected the faulty wiring. The document is really, really, really technical, but pretty well written and explained. Enjoy? Many of you have read Michael Teitelbaum's article about the lack of a STEM shortage. I've actually purchased and mostly read his book, "Falling Behind?" Naturally, I enjoyed it, but I found it a bit weak in spots. Here's a link to a YouTube video of an Economic Policy Institute colloquy between Dr. Teitelbaum and number of prominent scholars about the book and science/technology workforces issues in general, including a very interesting critique of the book by Jonathan Rothwell, a research associate at Brookings. My impression of Dr. Rothwell is not particularly positive; I found him irritating in the debate between himself, Salzman, Atkinson and Hira that I've posted on before. But I enjoyed listening to his portion of the colloquy, especially once I turned off the ARRRRGH part of my brain and just considered his data. Most of his data comes from US government datasets. I don't agree with many of his conclusions, but it is important to engage with the best of your opponent's data. Anyway, I found this graph by Dr. Rothwell particularly demonstrative of the difference in real (i.e. 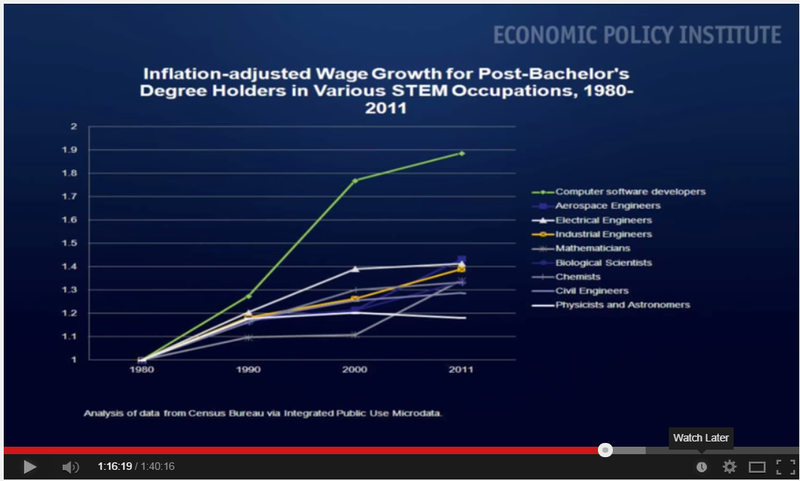 inflation-adjusted) wages over the years between people working in certain sectors of the computer industry (in this case "computer software developers") and chemists and biological scientists. It's apparent (to me, anyway) that when people say that STEM workers make good salaries with strong wage growth, they just mean TE. A science experiment went awry at the Terry Lee Wells Discovery Museum, creating a chemical flash that injured up to 13 Wednesday in Reno, officials said. Of those 13, eight children and an adult were transported to Renown Regional Medical Center, the city said in a statement. Primary injuries include minor burns and minor smoke inhalation, the statement said. Four people were treated at the scene and released, Reno police officer Tim Broadway said earlier. Reno Fire Chief Michael Hernandez said it was a routine experiment involving the simulation of a tornado that is conducted daily at the museum, 490 S. Center St. The officials said a methyl alcohol and boric acid mixture caught fire during a routine exhibition that is conducted each day to create a whirling tornado effect. City of Reno spokesman Matthew Brown said that a preliminary investigation indicates it was not an explosion but a chemical flash, which is "similar to if someone threw gasoline on a fire." The demonstration requires you to use a mesh garbage can and a spinning turntable. I suspect that the garbage can tipped over while spinning and it lit the jug (or its fumes) on fire. Maybe I'm wrong, but I suspect that's what happened. Nope, see below. Terry Lee Wells Discovery Museum staff reacted quickly after an accident that injured up to 13 late Wednesday afternoon, Reno Fire Chief Michael Hernandez said. "According to our surveillance video within seconds they already had extinguishers out," Hernandez said. "They were well-trained and assisted our first responders." About a dozen children were seated 6 feet to 10 feet away from an experiment done routinely at the museum to simulate a dust devil or tornado, Hernandez said. The experiment uses methyl alcohol and boric acid and the order got switched and it caused a flash that lasted two to four seconds. "It's sort of a one, two, three process and they went one, three, two," Hernandez said. He described it as being like being too close to a campfire. "There was very minimal damage within the immediate area of where the flash occurred," Hernandez said. "There was an easel immediate adjacent to the demonstration and it did not even get knocked over." Given the smaller quantity of chemicals they used in the demonstration, there wasn't much of a chance of a more serious flash, the chief said. Nothing that would have blown out windows, for instance. One child suffered second-degree burns and was going to be kept overnight at Renown Regional Medical Center for observation, Hernandez said. He visited all the children taken to the hospital Wednesday night and most seemed shaken by the incident. The fire department will recommend the museum review its procedures. "I think at the end of the of the day it's going to come down to a simple accident in procedure," Hernandez said. "As the fire chief, I'm not going to call them and say, 'Please stop doing this procedure.' The fact is, they've been doing this for quite some time. This is probably an isolated event." Museum spokeswoman Meagan Noin said they had no new comment this morning. "We are still investigating what happened so we don't have any new information at this time," Noin said. I'd like to know what the different order of operation was -- was the methanol added after the flame was already lit? Odd. I'm sort of weirded out by the fire chief's initial judgment, but hey, maybe he knows something I don't. Assuming that I'm correct that the methanol jug was part of the problem (and seeing as how it continues to be a problem with the rainbow flame demonstration), you can't have a larger source of methanol in the same vicinity as the lit demonstration. Assuming I'm right about the tipping of the flame, the turntable needed secondary containment. Nope, see below. The kids needed to be much further away from the experiment. Obviously, we don't have all the facts yet and my interpretations of the photos/video could be entirely incorrect. That said, I think the need extreme caution with experiments involving burning methanol has been demonstrated one more time. UPDATE: This other video from ABC News shows the exact moment that the flash occurred, which seems to suggest that the instructor was adding methanol while another flame was lit? Well, that would explain it. Yeesh. Skokie, IL: It isn't often that you see corporate lab manager positions, but this appears to be one from LanzaTech. They want a B.S. in chemistry (advanced degree preferred) and 10+ years experience in the laboratory. I think this could be a great position for the right person. Seeking experienced Data Scientist with a PhD in life/health sciences, computational biology, or closely related field, and at least five years of experience performing computational research in a pharmaceutical setting. The candidate will be expected to apply state of the art computational approaches to elucidate the biological profile of small molecules regarding their targets, off-targets, and phenotypic outcome. Pleasanton, CA: Here's a director-level position at Roche; they're looking for a leader for their nucleic acid group. This is an opportunity for you to further develop your managerial and technical skills in a highly visible position. This position ensures a safe, efficient, and high paced work environment while developing the talent within the lab. You will be a team member within the Analytical Services Department, which is responsible for all analytical testing completed with the Geismar Site. The laboratory operates 24/7. BS degree preferably in Chemistry or Chemical Engineering and minimum 2+ years of chemical manufacturing/laboratory experience OR High School Diploma/GED and minimum 8+ years if experience in a chemical manufacturing/laboratory environment is required. Experience with direct supervision of a group or department is a plus. Personally, I think it's great that they're willing to consider someone that's trained "on the job" for this position, but it's certainly unusual to see. Cincinnati, OH: LyondellBasell looking for an experienced Ph.D. analytical chemist; looks to be polymer chemistry-oriented. Menlo Park, CA: Pacific Biosciences is looking for a M.S./Ph.D. surface chemist with 5+ years experience. Is the desire for experience with "JMP, MatLab, MySQL, Visual Studio" typical? The Chemical Educational Foundation (CEF) (www.chemed.org) is looking for chemists to use in You Be The Chemist Challenge marketing pieces and events for this year’s “careers in chemistry” theme. (The Challenge is an academic competition for grade 5-8 students that focuses on chemistry and its real-world applications.) For example, we might feature a few chemists on a periodic table poster to distribute to schools. We are looking for employed chemists between the ages of 20-35 (i.e., people middle school students could see themselves becoming in 15 years) who can provide us with: 1) a high-quality headshot and 2) a few sentences about what they do, focusing on aspects of their job in chemistry that might be of particular interest to grade 5-8 students. If interested, please send a headshot and a few sentences about what you do to Elena Lien at elien -at- chemed/dot/org by September 19. ...The realities of doing science, however, soon butted heads with Shambayati's idyllic view of it. He found that chemical synthesis was slow and full of setbacks — “a bit like banging your head against the wall for long periods of time”, he says — and he was put off by the political aspects of science, exemplified at the time by bickering over who discovered HIV. Still, he did not hesitate to apply for faculty jobs at several top universities while finishing his PhD, and he received more than one offer. But a good salary was tempting to Shambayati, who felt a deep obligation to support his family; his parents had fled Iran after the 1979 revolution, leaving their house and savings behind. Shambayati set up an interview with his friend's bosses at Banker's Trust, which was later bought by Deutsche Bank. The investment bank was a leader in derivatives trading and was looking for quantitative, analytical thinkers such as Shambayati. He accepted a job earning many multiples of an academic salary, figuring that he could always go back to do a postdoc if things did not work out. In one sense, this is a great article because it highlights people who have been successful at science, but have chosen to work outside of science. It is nice in that it highlights professors (Schreiber, for example) who do not take personal offense at the fact that their successful students do not become tenure-track professors. I really like hearing about Dr. Shambayati's personal background as well as a glimpse of what must have been an extremely traumatic experience at Goldman. In another sense, I am so tired of these articles. Highlighting yet another physical scientist (or physicist, or mathematician, or wildlife biologist) who decided to go into finance isn't exactly new. Comments about approving or disappointed PIs aren't new either. What frustrates me the most about articles like this is the implied suggestion that paths like these are still easily open to scientists who wish to follow them. I'm going to guess that now, Goldman gets approximately a bajillion résumés a week from scientists who wish to earn Wall Street cash as opposed to the late 1980s. Web entrepreneurship (the subject of the second set of vignettes in the piece) is a thoroughly crowded field now. Doesn't mean that scientists shouldn't consider it as a potential source of employment (they should), but I just don't feel that these particular stories are relevant. Rant over. Cambridge, MA: MIT is searching for a professor of chemistry, preferably at the assistant professor level. Focus for the position: "...the areas of inorganic, organic or physical chemistry, broadly defined." Applicants with experimental or theoretical/computational research interests are encouraged to apply, as are candidates with interdisciplinary interests. Experiment or theoretical? That about covers it, yes? Ithaca, NY: Cornell University is searching for an assistant professor of chemistry, preferably in the areas of inorganic, materials, organic, and theoretical chemistry. Evanston, IL: Northwestern University desires an assistant professor in organic chemistry or "organic systems chemistry", which is a term I've never heard of before. Rehovot, Israel: The Weizmann Institute of Science is looking for assistant professors in chemistry. West Lafayette, IN: Purdue University is looking for a tenured or tenure-track professor of chemical education. Narrow number of those, I'm guessing. This year, I dedicate this song to adjunct professors of chemistry. Your contributions are appreciated by me. To my American readers, a very happy Labor Day to you and your family. To people in the rest of the world, happy Monday! Unemployment is easing in the U.S. economy as a whole, and that trend is reflected in the chemical sector, according to the latest figures compiled by the American Chemical Society. “The unemployment rate of our domestic chemistry workforce is once again under 3.0%, as it was prior to the economic downturn of 2008–09,” notes Elizabeth C. McGaha, assistant director of ACS’s Research & Brand Strategy (RBS) department, which collects the data. If I were King of the ACS (and it is a good thing I am not), I would make measuring/finding this number a top priority. The blue monster is winning: One of the interesting aspects of the ACS Salary Survey in recent years is its focus on how chemist wages losing ground against inflation. This year is no different. Despite the discrepancy in the extent of unemployment, Ph.D.s are sharing the same fate as their colleagues in terms of wage increases. For all three degree levels, median wages this March were essentially the same as last year. The median salary for chemists with a doctorate was $102,000, for those with a master’s degree was $85,000, and for those with a bachelor’s degree was $72,000 (see salary trends table on page 71). But the story gets worse: These findings are stated in so-called current dollars, and therefore don’t account for changes in the cost of living. Calculating salaries in constant dollars—a practice that eliminates the effects of inflation—shows that chemists at all degree levels continue to lose ground with respect to the rising cost of living. Between 2013 and 2014, salaries adjusted for inflation fell 1.5% for each of the three degree levels. Looking at the data in the longer term highlights stark trends in chemists’ purchasing power. Compared with a decade ago, median salaries have shrunk 11.7% for Ph.D.s, 6.8% for chemists with M.S. degrees, and 7.9% for those with bachelor’s degrees, in terms of constant dollars. This is a big problem, I would think. I would love to know which professions' median wages consistently beat inflation.